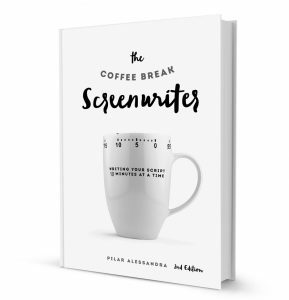 Packed with ten-minute writing tools, The Coffee Break Screenwriter keeps it focused and simple. Writers — from novice to professional — benefit at every stage of the writing process with a relaxed, “ten minutes at a time” method.“Ten-Minute Lectures” and “Take Ten” writing templates distill and demystify old-school theory, helping writers unblock, outline, finish pages, and move forward. Plus, advice from working writers on how to use time more efficiently! This second edition updates examples and pitch templates and adds television to the mix, helping you to write your TV pilot as quickly and efficiently as your screenplay. Send proof of purchase to inquire@onthepage.tv and you’ll receive an e-mail download of the key templates and worksheets within the book.